Reinvent your audience interaction. Reinforce your megaphone advertising with two tin cans and a shoestring. Simple and efficient two-way communication that connects with your audience in an honest and authentic manner. Print ads, TV commercials, radio spots: traditional promotional campaigns that rely on smoke and mirrors to persuade and manipulate the consumer into believing. With a public growing increasingly suspicious of megaphone advertising, interpersonal communication is a necessary strategy to rebuild the trust. 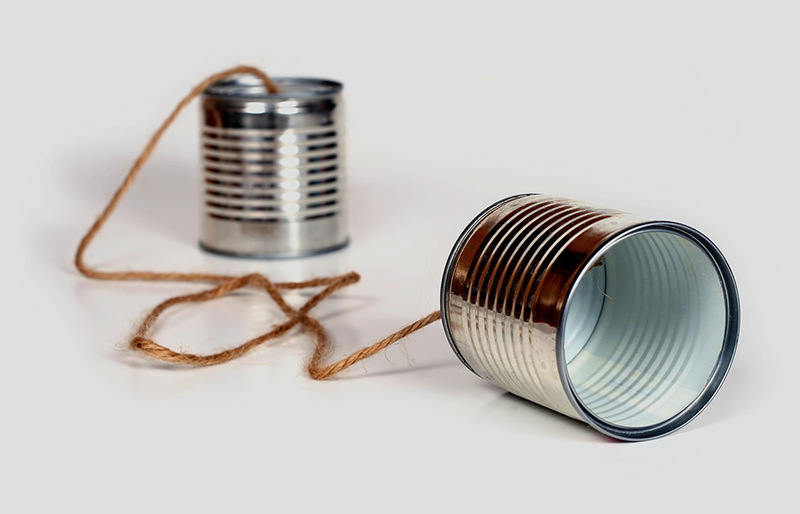 Consider, instead, the tin can telephone; a two-way symmetrical model of communication between your brand and your consumer. By giving your audience a voice in the decision-making process, the organization and consumer adjusts and adapts collaboratively. Professor James E. Grunig, a noted public relations theorist, introduced the theory in 1980 claiming this model “emphasizes communication exchange, reciprocity, and mutual understanding,” which creates a sense of co-ownership of the brand between the audience and the company. They become more than a consumer; they evolve into an advocate. With both the organization and its followers at the executive table, effective, long-lasting relationships are established. Traditional methods of gathering customer feedback include suggestion boxes or surveys, but these techniques are generally ineffective. With social media, however, you can leverage the latest technologies to engage your customer effectively. For example, during the 2008 recession, sales and traffic for coffee behemoth, Starbucks, slipped for the first time since IPO. Founder Howard Schultz brought the company back to its roots, sharing great coffee with friends, by launching their microsite MyStarbucksIdea, a dynamic online suggestion box allowing customers to voice ideas about what they want to see at Starbucks. When the company returned to their core values and invested on digital marketing and social media to publicize and implement this change, Starbucks experienced its first U.S. same-store sales gain in two years. Marketing tactics that included strategic messaging and distribution to mass audience are shifting to the idea that the public is a co-creator, a co-owner, and an incredible promotion channel. Traditional word-of-mouth marketing is defined as spreading brand awareness through informal, person-to-person communication between a non-commercial communicator and receiver regarding a brand, product, or service. However, content marketing and social media offer a platform allowing brands an opportunity to directly interact with the public to develop personal relationships and encourage brand loyalty. Rather than sales pitches, however, these social media conversations should be authentic and transparent. In a study of over 1,500 consumers, conducted by the market research firm Chadwick Martin Bailey and iModerate Research Technology, 51% of Facebook fans and 67% of Twitter followers are more likely to buy the brands they follow or are a fan of, thus demonstrating the importance of maintaining an online presence. By establishing this personalized relationship with its audience, the study also found 60% of Facebook fans and 79% of Twitter followers are more likely to recommend those brands after becoming a fan or follower. Your believers will introduce your brand into new and unique markets. Conventional marketing tactics of “shouting” at your audience, regardless of whether they want to hear it, is falling to the wayside in a world where digital marketing, content and social media are king. Consumers want to actively take part in your brand, so put down the megaphone and pick up tin cans instead. to Inspire Belief in your brand and transform them into powerful brand advocates.